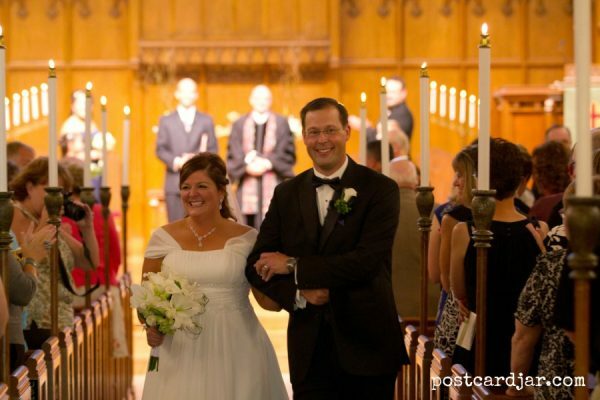 Six years ago today, after one year of dating and a two-month engagement, Steve and I were married in a beautiful wedding ceremony at 10:30 in the morning at Westminster Presbyterian Church in Lincoln, Nebraska. Yes, 10:30 a.m. is a non-traditional time for a wedding, but that’s what you get when you book the church just eight weeks out. Fortunately, we’re both morning people anyway and Steve was happy to have a brunch wedding reception where he got to eat bacon on his wedding day. A year later, when we had our first wedding anniversary in 2012, we had no idea what to get each other. 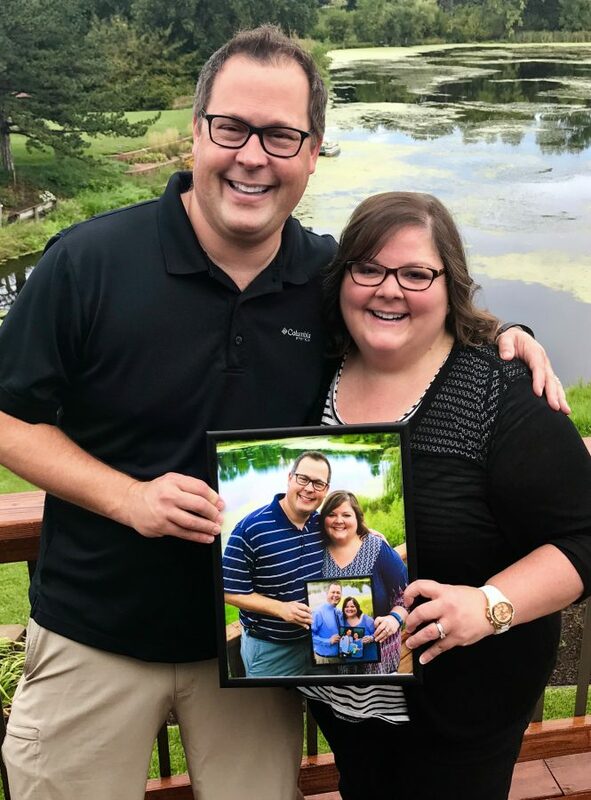 Having gotten married when we were ages 38 and 42, we had accumulated almost everything we really needed or wanted before we said, “I do.” So, we decided to commemorate the occasion with a photo each year and instead of trying to figure out gifts for each other, we’d purchase something together for our home. Then, in another nod to traditionalism (after all, we had organ music at our ceremony and we didn’t live together until the day after our wedding) we decided we’d try to find something each year that fit the traditional anniversary gift suggestions. You know the ones: paper, tin, china, silver, gold, pearls. We’d keep the cost to under $100 and just to add a twist of our own, decided we’d look for something related to our love for travel. We are celebrating our 6th anniversary this year, and so far, we’ve been able to stay within our budget (mostly), the traditions, and the travel theme. 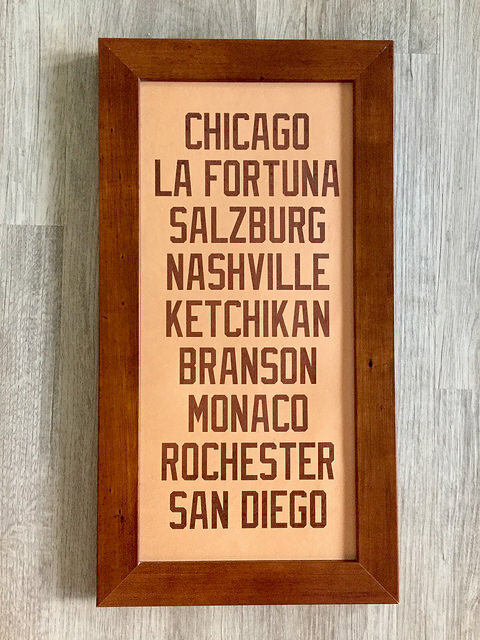 Who knows how long we’ll be able to keep it up, but at least for now, we’ve added some unique pieces to our home, and created lasting memories of our travels. Here’s a look at the gifts we’ve given ourselves to celebrate our first six years of marriage. Our sixth year of marriage took us lots of new directions. But the important thing is, we went in those new directions together. 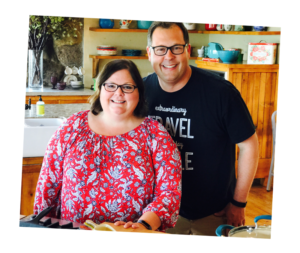 We focused more on our blog, we traveled to new places like St. Kitts in the Caribbean and Pawhuska, Oklahoma, and we got more involved in our church and local community. And, as you may recall, after 21 years in public education, Steve resigned his position this spring and we’re still trying to figure out just exactly where to go from here. 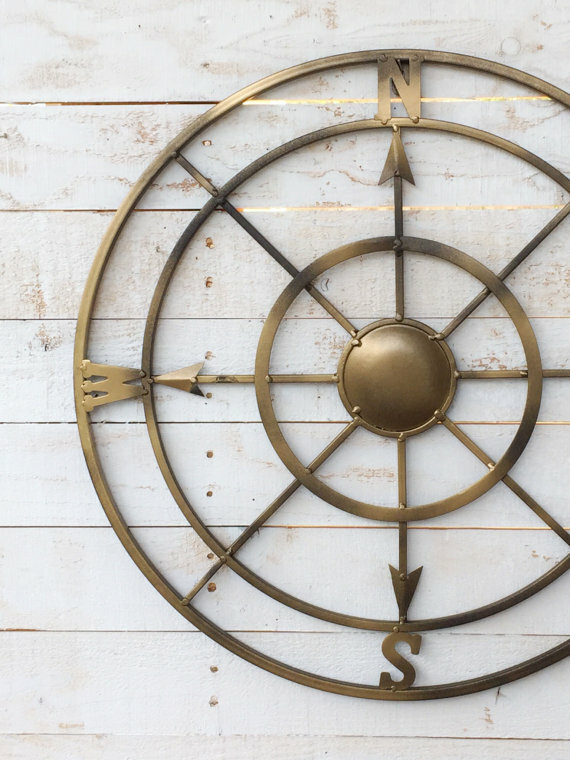 Needless to say, this iron compass wall art seemed like an appropriate anniversary gift this year, as we aren’t sure which direction we’ll go next. For our sixth anniversary, we ordered this gold compass wall art that we plan to hang in our home office. It is sold by a family-owned Etsy business called AlacartCreations. We found this metal compass on Etsy in a shop called AlacartCreations. It sells for $79, so it was under our budget. Ironically, we don’t have it in hand just yet because when we ordered it the seller was on vacation, which we totally understand. We’ll look forward to getting in when she returns and when we do, it and will be a lasting reminder of the new direction our lives took in our sixth year together. There were lots of options for gifts made out of wood for our fifth anniversary. We considered some type of wooden picture frame or custom wooden sign but both seemed a bit ordinary and meaningless. Then, a few days before our anniversary, while browsing at a local shop called Home & Closet (a must see if you’re anywhere near Lincoln, Neb. ), we spotted this small, wooden box, and we knew it was meant to be. 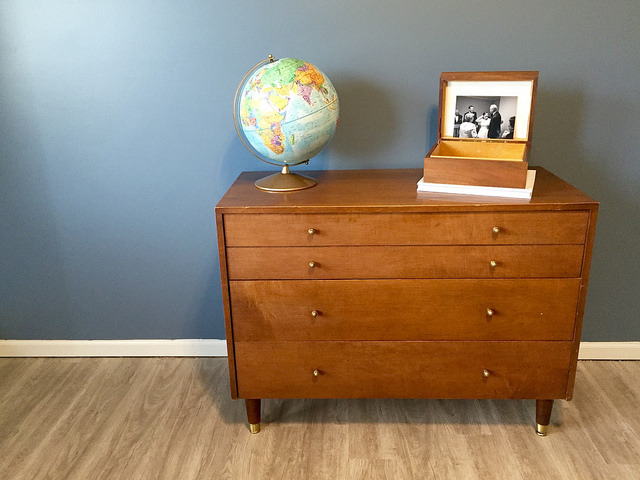 We found this adorable wooden box for $25 at Home & Closet in Lincoln, Neb. It holds lots of travel memorabilia from our first five years of marriage and will look great in the home office we are redecorating. It would fit perfectly in the home office we were in the middle remodeling and it was just the right size for storing some of the memorabilia we’ve collected from our travels these first five years. We snatched it up for $25 (or least expensive anniversary gift yet) and filled it with ticket stubs, photographs, hotel keys, and of course, a few postcards. 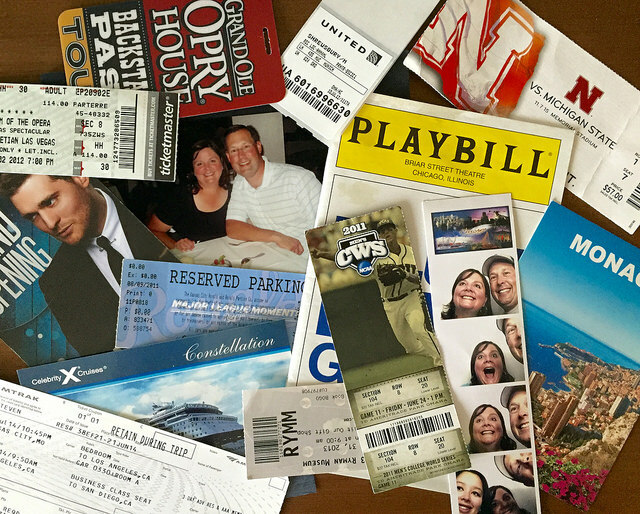 We save some of the memorabilia from our travels such as ticket stubs, photo booth photos, and postcards. Well, that was bit over our budgeted $100 limit, so we scratched that idea. Pinterest and Etsy were dead ends too, so I came up with something on my own. I have always enjoyed photographing flowers when we travel, so I went back through my photographs and selected 16 pictures I’d taken of flowers on our travels together — like this one below. We ran across the most amazing flower garden before leaving Anchorage, Alaska. 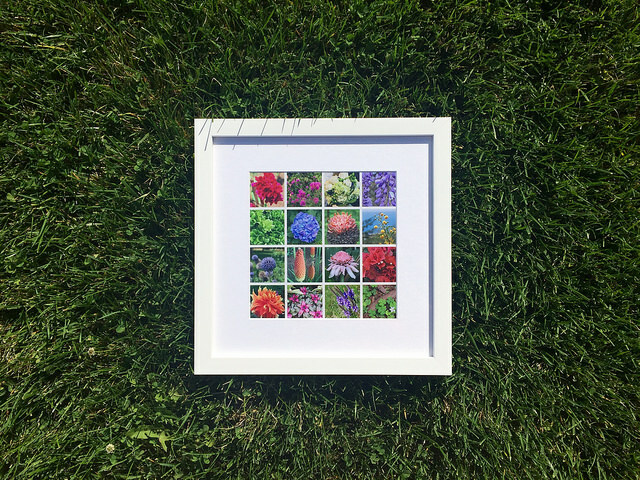 I arranged them in a 4×4 grid (since it was our 4th anniversary) and for about $60, purchased a framed print of the flower photos from www.socialprintstudio.com (formerly Printstagram) that arrived just in time for our anniversary. It turned out great! 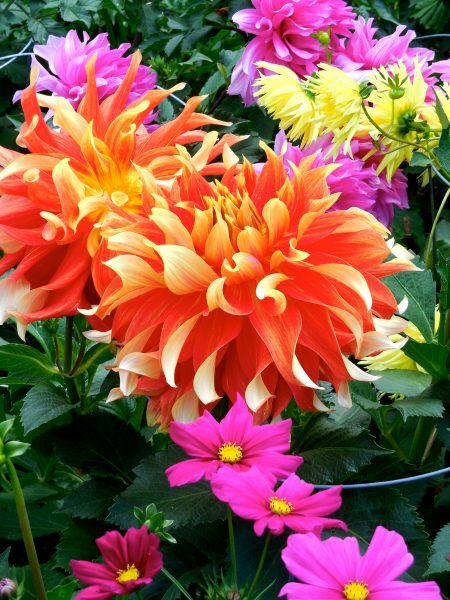 It’s so fun to look back at flowers from some of our favorite places, including Costa Rica; Marathon, Fla.; Monaco; Muir Woods; Monticello; the Nebraska Sandhills; Sonoma Valley; and Las Vegas. It includes photographs of wildflowers we spotted along on the highway in the Nebraska Sandhills; the wisteria we saw while on a wine tasting trip to Sonoma; gorgeous flowers we found in Anchorage, Alaska; and even the flowers from a bouquet at our wedding. They all bring back wonderful memories of the places we went during our first four years of marriage and the picture was a great addition to a gallery wall/shelf in our dining room this summer. 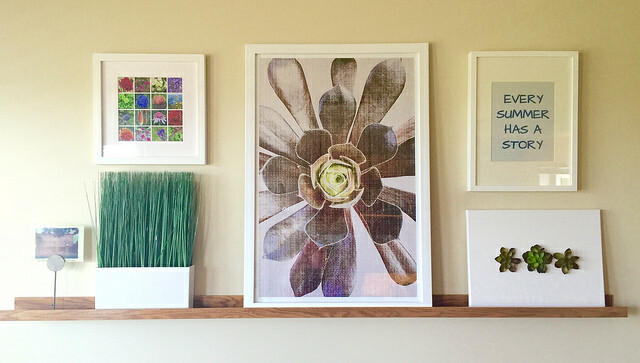 Our fourth anniversary gift fits in great with this gallery wall/shelf in our dining room. 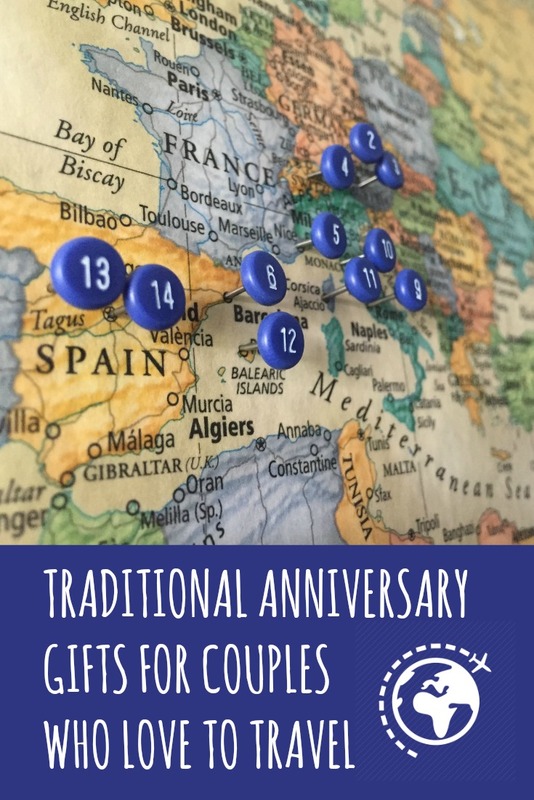 This one was a little tricky, so I just Googled “travel related leather anniversary gifts.” I got quite the array of suggestions but wasn’t really impressed with leather passports covers or luggage tags I saw online. Then I ran across a shop on Etsy called Killogrin Creations, that makes a subway scroll on leather with your life’s journey for about $70. It was perfect! Steve and I narrowed a list of places we’d traveled in our first three years of marriage to nine and sent it to the online store. In a couple weeks, we had a unique, customized piece made of leather and the perfect gift for travelers like us. We included a variety of cities to which we’d traveled. They weren’t all necessarily our favorites, but they were the places that best summarized out first three years together — our honeymoon to La Fortuna, Costa Rica; our first family vacation to Ketchikan, Alaska; three Sine Die Adventure cities (Chicago, Nashville, and San Diego); Branson, Missouri, near where our daughter went to college; destinations from our first trip to Europe together (Monaco and Salzburg); and of course, Rochester, Minnesota, where we traveled the most for my appointments at the Mayo Clinic there. For our second anniversary, I found these great hand painted, continent pillow covers on uncommongoods.com. They fit perfectly in our downstairs living room that has a bit of a travel theme going on already. I purchased this set of three continent pillows from uncommongoods.com for about $95. According to the website, the pillows cases are made of 100% cotton and the decoration is applied using Batik, a traditional Indian art to create patterns on fabric. The company that makes them helps the greater good by providing fair wages and development opportunities for artisans in South West India. I think they look fantastic on the sofa in our family room year round. 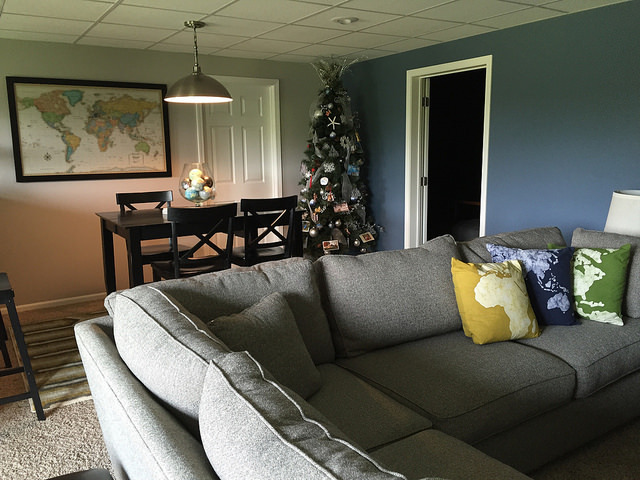 This set of three cotton continent pillows was a perfect addition to our travel-themed family room. The first anniversary was pretty easy. Paper maps seemed like the most logical travel-related gift and we had already thought about purchasing maps to document our travels. 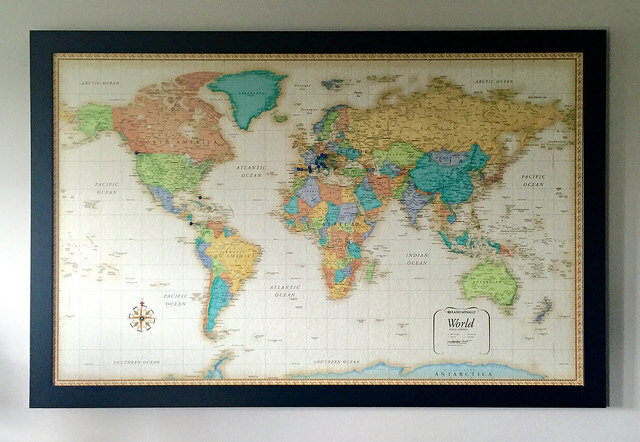 We display our world map in our family room and add numbered pins to the new places we travel to each year. We had gotten the idea from Steve’s grandparents, Bud and Kathleen Teget, who had displayed a large world map in their den, marking the 70-plus countries to which they’d traveled together. We loved the idea, so for our first anniversary, we purchased a world map and a U.S. map at a local office supply store. We took both to a local framer who laminated the maps, mounted them on foam core, and framed them in wood frames for about $100 each (I know, double the budget on the first year). 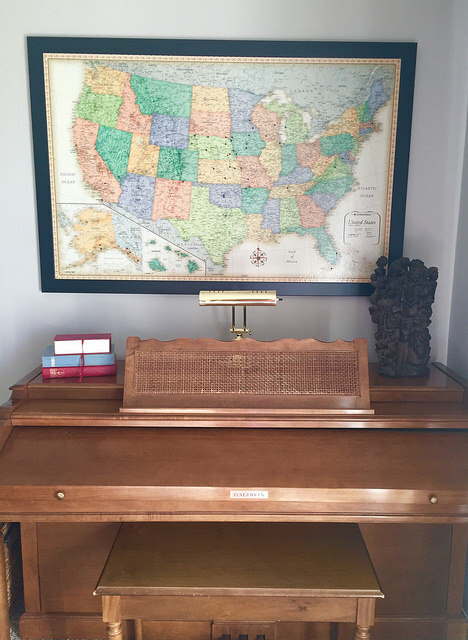 Our U.S. map hangs above our piano and marks all the places we’ve traveled together. On our first anniversary, we hung the maps on the walls in our basement and stuck a #1 pin in the first place we traveled as newlyweds: Costa Rica. We just love the maps and can’t wait to add pins to them each time we return from a trip. I found the number pins HERE on Amazon. 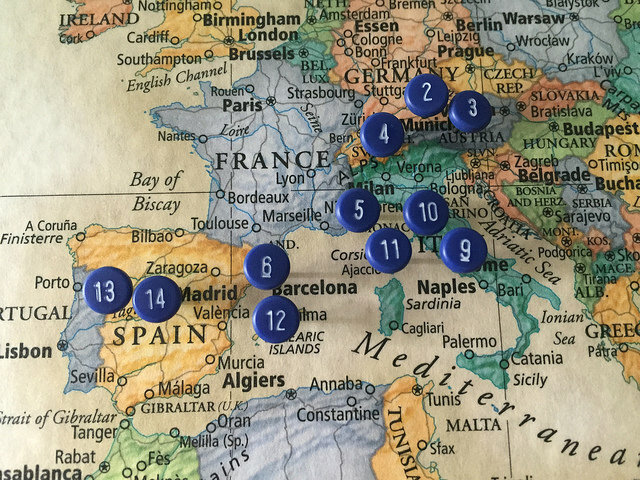 We’ve been adding numbered pins to our map each time we travel abroad. Anniversaries are special for us and we love celebrating them. We both waited a long time before we found one another and our traditional anniversary gifts are wonderful reminders of just how blessed we are to be on this journey together. Next year for our 7th anniversary, the traditional gift is copper. Any suggestions? Let us know, we’d love to hear from you. As always, thanks for sharing and Pinning! Really enjoyed this story! What fun u two have! Can’t wait to read more.